Front: (1) Asma Jahangir’s portrait. (2) Lahore Fort built in 11th century in Punjab province, Pakistan, Asma’s birthplace. The fortress is a unique structure that was influenced by both Islamic and Hindu architecture. (3) Pakistani banknotes. 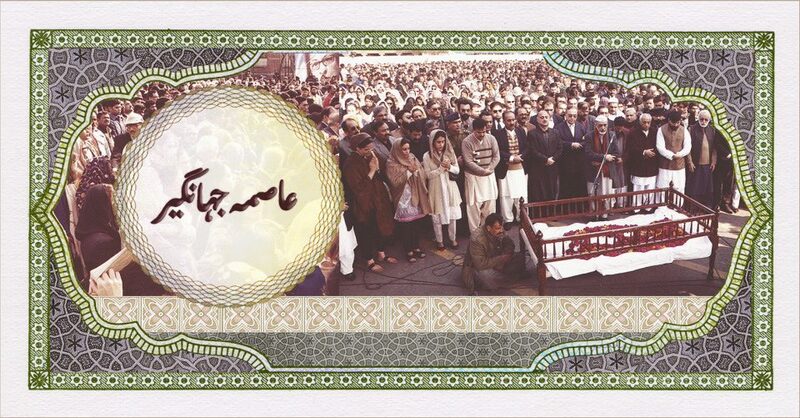 Back: (1) Asma Jahangir’s funeral – a display of women’s resistance. Countless women participated at the Janaza, an Islamic funeral ritual, and prayed side by side with men, breaking the patriarchal/orthodox funeral traditions. There were thousands of men and women who attended the funeral to bid farewell including many from the Sikh, Christian, Sunni, Shia and Ahmadi communities. 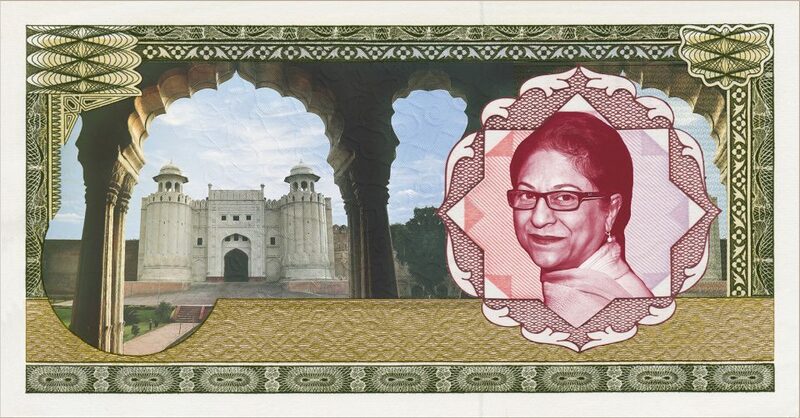 (2) Pakistani banknotes. Asma Jahangir was a prominent human rights lawyer and social activist who worked tirelessly all her life defending the rights of many marginalized groups including women, religious/ethnic minorities, survivors of sexual assault, and children. Despite being imprisoned, threatened by the country’s militant religious right, intimidated by the military and those in power, she continued her fight for democracy, always speaking the truth. Asma co-founded and chaired the Human Rights Commission of Pakistan. In 1980 Asma and her sister Hina Jilani, along with few other activists/lawyers, formed the first law firm established by women in Pakistan. They also formed Women’s Action Forum (WAF), a group campaigning against Pakistan’s discriminatory legislation. Her contributions to human rights go beyond Pakistan. She was appointed by the UN to serve as the United Nations Special Rapporteur on Freedom of Religion or Belief and as a Trustee at the International Crisis Group. In 2016, she served as the UN Special Rapporteur on the Situation of Human Rights in Iran, remaining until her death in February 11, 2018. She is the recipient of many human rights awards. AGHS Legal Aid Cell was co-founded by Asma Jahangir in 1980 to provide free legal representation for vulnerable women, children, bonded labourers, people in prison and religious minorities. It is now the leading law firm in constitutional and family law related legal work. The fundamental principles of AGHS policy are essentially concerned with strengthening respect for human rights through providing free legal representation and by building a stronger constituency of activists, mainly women to challenge non-discrimination, violence and threats against the vulnerable. AGHS highlights violations of human rights and provides free legal representation to end impunity for perpetrators of human rights violations. AGHS has taken up impressive cases to defend those accused of blasphemy, constitutional petitions to challenge military courts, cases for the protection of those who are tortured or kept under arbitrary detention as well represented the families of those who disappeared. It has won a number of landmark cases in promotion and protection of human rights. AGHS has a wide impact despite limited financial and human resource at its disposal because the organisation is committed to raise the level of awareness on human rights issues and has succeeded in doing so in many respects. Some of AGHS’s Board members and staff have been physically attacked, held hostage, threatened and vilified for promoting women and minority rights. AGHS has been at the forefront of the women’s movement and played a decisive role through street protests against General Zia ul Haq’s anti women and minorities legislation, the Hudood Ordinances and Law of Evidence. AGHS is an active supporter of the Women’s Action Forum since 1983, and the Human Rights Commission of Pakistan (HRCP) was set up at the AGHS office. South Asians for Human Rights (SAHR) was also proposed and initially setup by AGHS, who hosted its Secretariat for six years. AGHS networks with jail and court administrators to sensitize the police, judiciary and prison officers to human rights. Foreign Exchange incorporates the emblems taken from banknotes and utilizes images from news media to highlight voices of resistance from countries that have been impacted by U.S. national interests. 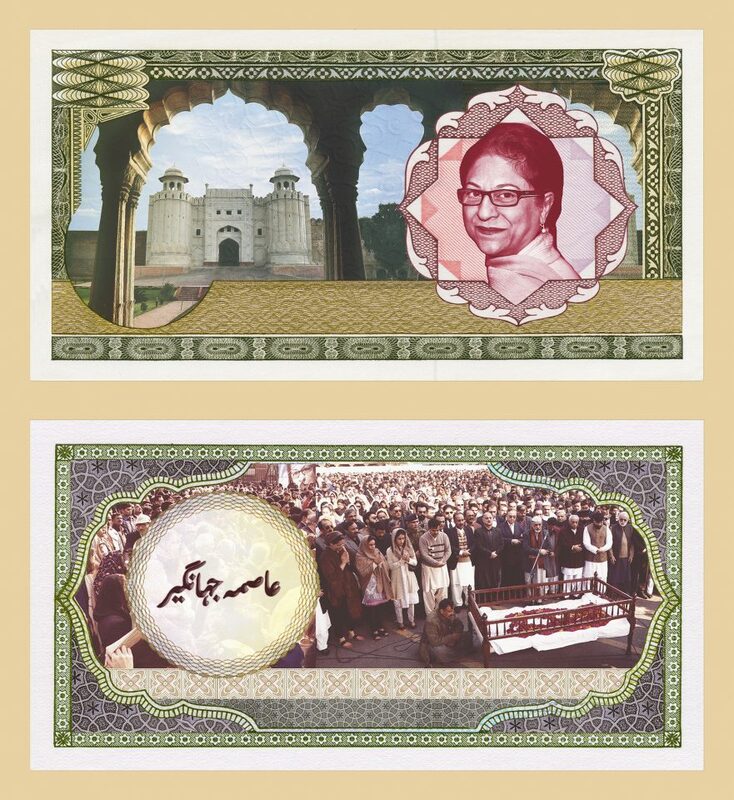 The banknotes feature influential figures and monumental events that draw attention to socio-political tensions existing both within a country’s borders and beyond. Foreign Exchange offers an alternative platform to archive and share cultural currencies.